We’ve tested quite a few MINI competitors over the years in an effort to keep a solid grounding in the automotive landscape. With today’s review we’re doing something a little different. We’re testing a car that retails for roughly $30,000 more than the stock Cooper. 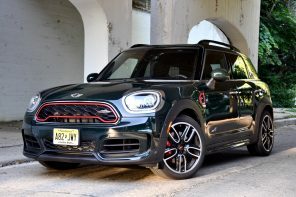 So rather than a comparison test, think of it as a glimpse into different category of automobiles that shares a few of the fun to drive attributes with the MINI. For those that don’t know much about the car, the Z4 M Coupe is the relatively rare M Brand version of the Z4 Coupe. The Z4 Coupe (the basis of the Z4M Coupe) is the newly released coupe version of the Z4. The Z4 Coupe features a huge increase in rigidity, the addition of a hatchback, and gorgeous looks that (in these eyes) transforms the already good looking Z4 into something of an instant classic. The M version tested here features, in a word, more. On paper the M Coupe (as it’s referred to by many) has it all. The E46 M3’s sensuous inline six churning out 330 high-revving horsepower. M3 CSL brakes – a healthy improvement over the stock M3 stoppers. Less weight (3230lbs) and more nimble than the M3. And finally a driver focused cabin and steering wheel that puts the M3’s to shame. 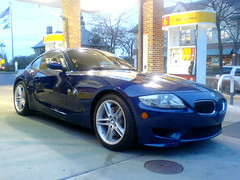 The M Coupe is the most testosterone laced, (dare I say it) manly modern car I’ve ever driven. Upon entering the cabin you realize that this car is focused on one thing – driving and driver enjoyment. You sit relative low in the seats with the center tunnel higher than what is found in cars like the M3. The cabin fit my 6’2″ frame like a well formed glove, my hands falling at the controls as if the car silently confirgured itself around me. The shifters’ throws (no auto or semi-auto is available) reinforce the driver’s car feel and the hot-knife through butter actuation is what you’d expect from an M car. But it’s the steering wheel that steals the show. Thick, soft and perfect in every curve and stitch, it says driver’s car like few things can. But the highlight of the interior for me are the sport seats. Incredible lateral support, extendable thigh support and quite comfortable, this is the type of seat we could only dream of in the MINI. Turning the key you get the familiar orange glow on the dash (except the speedo and tach which are strangely white) that is found in all BMWs and MINIs. 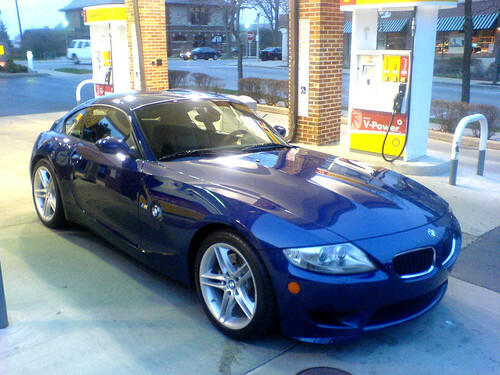 The Z4 uses the E46’s electronics system and thus vaguely similar to the R50/R53 MINI’s as well. So that means simpler radio controls and no iDrive available. 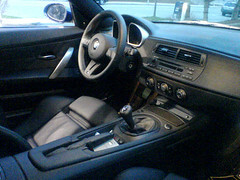 Like the R56 MINI, the M Coupe (like all Z4s) features a sport button that quickens response times from the accelerator. Unlike other Z4s the sport button does nothing to the steering. With the electronic steering being dumped by the M Division in favor of the M3’s hydraulically assisted set-up, there’s no alteration possible. Luckily the steering is just about perfect as is and a marked improvement over the standard Z4. Well weighted while offering exceptional feel and feedback, it’s hard to find fault on public roads. The accelerator w/sport button on however, borders on almost too aggressive. Driving the car smoothly with it on takes practice that will probably elude many owners. Luckily the off position leaves little to be desired in terms of performance. As you release the clutch and give it gas, you realize (with the sport button on) that this car doesn’t do subtle. It is simply a beast. And while the acceleration fantastic, it’s the sound the engine makes at high revs that is truly addicting. I’ve always loved the sound of this engine in the M3 but it still seemed a bit muted in the cabin. The M Coupe doesn’t do muted. You can hear the double Vanos in all it’s glory as it sings through the rev range all the way up to 8000 rpms. Braking is equally impressive. The CLS sourced set-up scrubs off speed without drama. And the DSC (yes I did have it on once or twice) is calibrated to intercede only at the last possible moment. And then only subtle enough to make you believe, just maybe, you’re that good. Of course with the DSC off, creating oversteer is as easy as twitching your right foot around a corner. And (like all BMWs) the M Coupe is set-up to allow for easy control of power oversteer with it’s near perfect (50.2/49.8) weight distribution. 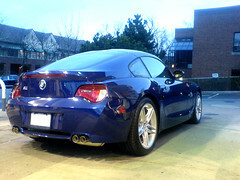 The BMW M Coupe is a rare car that appeals to only a small segment of the population. It’s a singular focused car that trades off space and usability for ultimate performance. Yet it’s these visceral thrills and the packaging trade-offs that give this car a personality that is hard to find in modern automobiles. It’s a throw back in all the right ways. The M Coupe is civil enough to be used a daily driver yet it has a soul that belies the hard and cold numbers we so often use to measure cars. I’ve had the chance to drive a number of rather interesting cars over the years. Yet few have had such profound impact on me in such a short amount of time. It flatters, scares and inspires within the space of a single corner. And like few cars sold today, it has a soul that is thoroughly endearing.